Choosing Dalmatian Puppies " "
If you’ve ever seen extremely young Dalmatian puppies, the first aspect you may notice about them is they have no spots. They are covered in white hair, and don’t actually develop their spots until they are a few weeks old. However, when it comes time for you to purchase your puppy, he or she will have the spots that are the most distinctive feature of the breed. That being said, aside from their short, fine and smooth white haired coat that is littered with black or liver colored spots, there are other features of Dalmatian puppies you need to consider before you make your purchase. For instance, the Dalmatian has a long head and a flat skull that is broad between their ears. The head should be entirely free from wrinkles and the muzzle should be powerful and long. The jaws are strong and are equipped with pristine white teeth that form a perfect scissor bite. The nose of Dalmatian puppies should be black if they have black spots and dark brown if they have liver colored spots. Just as the nose is a different color based on the color-type of Dalmatian, so are the eyes. The eyes of puppies with black spots are dark, while liver spotted puppies will have amber colored eyes. Despite the color, the eyes of Dalmatians are round, medium sized, bright and glittery. The eyes convey an intelligent expression. The ears of Dalmatian puppies are a medium size, fold down, and have a significant wide base that tapers to a round point. The ears are carried close to the head, but do not obstruct the dog’s hearing. Dalmatians have deep chests, strong loins and a strong level back. The back extends into their tail that has a good length. The tail is carried at a decent height but not too high. The tail slightly curves upwards, but should not curl over the back. It is desirable for the tail to be spotted. 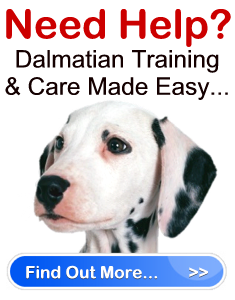 The legs of Dalmatian puppies are strong and will develop powerful muscles as they mature. The feet are compact and round and feature tough flexible pads. Dalmatians have plenty of spring to their walk. Finally, the last thing you may notice when looking at a litter of Dalmatian puppies is that not all the pups have spots in the same locations on their body. While the dogs will usually be covered with spots from the end of their muzzle to the tip of their tail, the spots will be randomly placed all over their body. Therefore, the puppy you choose will likely have his own unique spotting.